While exploring Nashville over the weekend, the mountains + gold leaves were absolutely breathtaking. We spotted this beautiful scenery while heading to downtown Franklin and had to stop for a little impromptu photo shoot. I mean, with this background, how could you not?! Just when I thought I couldn't love Everlane any more than I already do...they launched their fall cashmere line. This grey sweater is so warm + cozy and the perfect thing to throw on for a casual day outdoors. Also, as most of you know, I have a slight obsession with plaid scarves this season, so you can definitely expect to see this one alot more! I love this look! Perfect for the weekend!! Gorgeous pictures! We're headed to Nashville for the first time this weekend and I can't wait! Perfect look for fall. 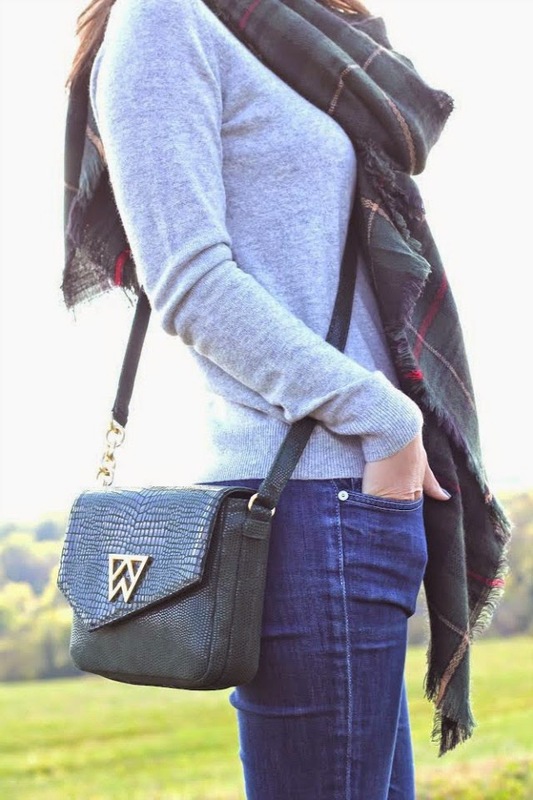 Love the KWynne bag! I just got booties like these ones! Do you wear socks with them? I can't figure out what to do! Beautiful outfit I love your scarf! This is such a pretty casual outfit and I love how you tied your scarf! I love that your outfit has so many great basics styled together in a cute way! Love your grey sweater. It's so perfect with your scarf. The scenery is gorgeous by the way. Nashville is on my list to visit. I hear the food is amazing there. Hope you had a great trip! Love you Kelly Wynne bag! This a perfect fall look! I love those earrings and the pattern of that skirt! What a gorgeous look and beautiful backdrop. Love the scarf and those boots! 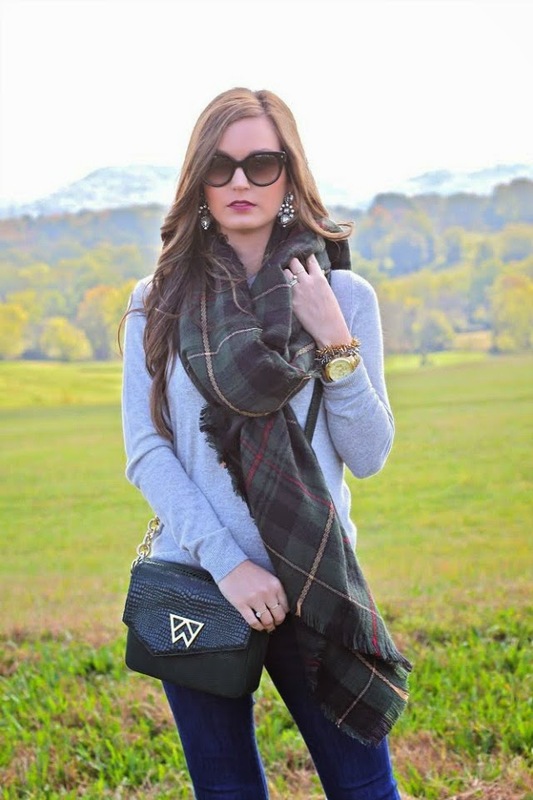 Great fall outfit! You're gorgeous!